Encapsulates keywords that are context sensitive or for languages not properly supported by Clang's lexer. Definition at line 670 of file FormatToken.h. Definition at line 671 of file FormatToken.h. Returns true if Tok is a C# keyword, returns false if it is a anything else. Definition at line 885 of file FormatToken.h. References clang::Token::getIdentifierInfo(), clang::Token::getKind(), clang::format::FormatToken::is(), and clang::format::FormatToken::Tok. Definition at line 877 of file FormatToken.h. 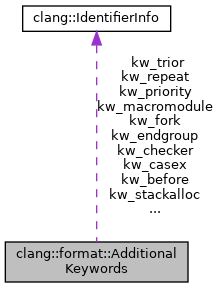 References clang::Token::getIdentifierInfo(), clang::format::FormatToken::is(), and clang::format::FormatToken::Tok. Definition at line 790 of file FormatToken.h. Definition at line 791 of file FormatToken.h. Definition at line 792 of file FormatToken.h. Definition at line 816 of file FormatToken.h. Definition at line 795 of file FormatToken.h. Definition at line 817 of file FormatToken.h. Definition at line 796 of file FormatToken.h. Referenced by clang::format::isJSDeclOrStmt(), and clang::format::mustBeJSIdent(). Definition at line 797 of file FormatToken.h. Definition at line 846 of file FormatToken.h. Definition at line 847 of file FormatToken.h. Definition at line 786 of file FormatToken.h. Definition at line 787 of file FormatToken.h. Definition at line 848 of file FormatToken.h. Definition at line 849 of file FormatToken.h. Definition at line 798 of file FormatToken.h. Definition at line 850 of file FormatToken.h. Definition at line 845 of file FormatToken.h. Definition at line 851 of file FormatToken.h. Definition at line 831 of file FormatToken.h. Definition at line 818 of file FormatToken.h. Definition at line 782 of file FormatToken.h. Definition at line 799 of file FormatToken.h. Definition at line 852 of file FormatToken.h. Definition at line 853 of file FormatToken.h. Definition at line 800 of file FormatToken.h. Definition at line 801 of file FormatToken.h. Referenced by clang::format::isIIFE(), clang::format::isJSDeclOrStmt(), and clang::format::mustBeJSIdent(). Definition at line 802 of file FormatToken.h. Definition at line 819 of file FormatToken.h. Definition at line 854 of file FormatToken.h. Definition at line 803 of file FormatToken.h. Definition at line 784 of file FormatToken.h. Referenced by clang::format::FormatTokenLexer::lex(), and clang::format::mustBeJSIdent(). Definition at line 804 of file FormatToken.h. Definition at line 820 of file FormatToken.h. Definition at line 821 of file FormatToken.h. Definition at line 855 of file FormatToken.h. Definition at line 805 of file FormatToken.h. Definition at line 806 of file FormatToken.h. Definition at line 857 of file FormatToken.h. Definition at line 828 of file FormatToken.h. Definition at line 807 of file FormatToken.h. Definition at line 822 of file FormatToken.h. Definition at line 788 of file FormatToken.h. Definition at line 789 of file FormatToken.h. Definition at line 858 of file FormatToken.h. Definition at line 859 of file FormatToken.h. Definition at line 785 of file FormatToken.h. Definition at line 832 of file FormatToken.h. Definition at line 833 of file FormatToken.h. Definition at line 860 of file FormatToken.h. Definition at line 783 of file FormatToken.h. Definition at line 823 of file FormatToken.h. Definition at line 862 of file FormatToken.h. Definition at line 840 of file FormatToken.h. Definition at line 842 of file FormatToken.h. Definition at line 808 of file FormatToken.h. Definition at line 864 of file FormatToken.h. Definition at line 834 of file FormatToken.h. Definition at line 835 of file FormatToken.h. Definition at line 836 of file FormatToken.h. Definition at line 867 of file FormatToken.h. Definition at line 868 of file FormatToken.h. Definition at line 809 of file FormatToken.h. Definition at line 839 of file FormatToken.h. Definition at line 841 of file FormatToken.h. Definition at line 866 of file FormatToken.h. Definition at line 865 of file FormatToken.h. Definition at line 824 of file FormatToken.h. Definition at line 825 of file FormatToken.h. Definition at line 810 of file FormatToken.h. Definition at line 811 of file FormatToken.h. Definition at line 869 of file FormatToken.h. Definition at line 870 of file FormatToken.h. Definition at line 871 of file FormatToken.h. Definition at line 872 of file FormatToken.h. Definition at line 873 of file FormatToken.h. Definition at line 812 of file FormatToken.h. Definition at line 813 of file FormatToken.h.